Hi Mark. You raise (as usual!) a some excellent points, good food for thought. 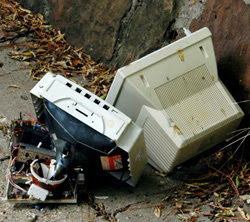 The EU adopted the RoHS and WEEE Directives in tandem, and that was not by accident. For the US to adopt a RoHS-like law but not one placing restrictions on WEEE would indeed likely lead to alot of hazardous materials being exported abroad. While RoHS legislation has a slim chance of passing the Congress (but not necessarily being signed by Bush! ), I would seriously doubt a WEEE bill would make it that far. In that case, does it make sense to push for national RoHS legislation alone? Also good point about how the US handles haz subs traditionlly. Getting anything banned is almost impossible and even heavy restrictions takes ages, lots of red tape and is quite costly. There is no reason to think this would change under a US RoHS regime. The EU and US chemical regimes have always had different approaches that have created frictions between them in fora like the OECD and UN bodies. With the recent adoption of RoHS and REACH in the EU, this is likely become the case even more. Maybe, just maybe, this situation -- as with the different state and local regimes in the US you allude to -- will prompt industry to either push the USG into real international harmonization talks (question is where -- Basel Convention? SACIM? Someplace else? ), or industry will adopt the toughest rules voluntarily rather than try swallow the costs of complying with many different regimes. As the Chinese curse goes, I think we live in interesting times. thanks for posting, you're so right. The distinction between passing 'RoHS-Like' regs and WEEE-Like regs is important, and as you say, they really need to go together. Also, the history you provide on the chemical regimes is interesting. Perhaps the "better living through chemistry" slogan didn't hit Europe quite as hard as it did the US.